There will be NO SCHOOL for all students this week. Teachers and support staff will report to work, however, to engage in professional development activities. 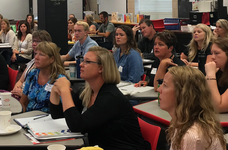 Our staff greatly benefit from professional development days when they can come together to learn strategies to more fully engage students in their learning, better manage challenging student behaviors, and sharpen their teaching skills. Literacy, problem solving and student engagement are just some of the areas of focus for this week's trainings. Fall conferences begin this week. 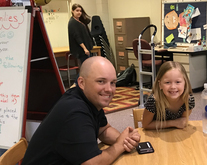 This is a wonderful time for parents to learn more about their student's goals for the year and hear directly from their child's teacher. You can sign up for conferences on Skyward. Questions? Contact your child's school. School board members met on Wednesday to discuss the district’s short- and long-term facility and financial needs; including a first look at possible budget reductions for the coming year. Read more. Independent financial auditors have given the district an “unmodified” opinion on its annual audit; the highest rating possible. The 2017-2018 Comprehensive Annual Financial Report, upon which the annual audit is based, showed no deficiencies in the district’s internal controls and no instances of noncompliance of government auditing standards. Read more. Stillwater Area High School students won 13 awards at the Minnesota High School Press Association's State Convention. The Pony Express took home six overall awards, while the Kabekonian yearbook earned two. Students also earned five individual awards for their work, including one first place winner. Teacher Rachel Steil was also honored as 2018 Minnesota Journalism Advisor of the Year. Read more. 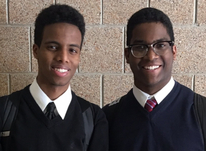 Stillwater Area High School seniors Abdulaziz Mohamed and Nikhil Kumaran are believed to be the first students of color to serve as student council presidents. The two not only hope to run an effective council, but they also aim to amplify the voices of their peers. Principal Rob Bach says the young men are impressive and have done an amazing job making a difference in the school. Read the Stillwater Gazette article. Seven candidates have filed for four open seats on the school board. Learn more about each of the candidates before you go to the polls in November. See a list of school board candidates online. The school board will hold a work session at 8 a.m. on Tuesday, October 23 at Central Services for the purpose of discussing district finances, facilities and legislative platform. See the official meeting notice.